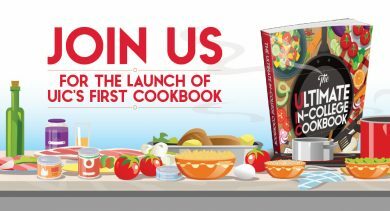 Join us for the launch of UIC’s first cookbook, “The Ultimate In-College Cookbook”, on Tuesday, December 4, 2018 from 11 a.m. to 3 p.m. in the UIC Bookstore. Stop by to purchase your exclusive copy, and enjoy food, a raffle, and a photo booth. The cookbook is a culmination of recipes submitted by UIC students, faculty, staff, and alumni. Proceeds from the sale of the cookbook will benefit the UIC Pop-Up Pantry operated by UIC Wellness Center. The mission of the UIC Pop-Up Pantry is to combat food insecurity among students.